THE B-MOVIE NEWS VAULT: Help Fund the Restoration, and Blu-ray Release, of William Fruet's BLUE MONKEY! Help Fund the Restoration, and Blu-ray Release, of William Fruet's BLUE MONKEY! CODE RED DVD TURNS TO HORROR FANS TO HELP RAISE FUNDS FOR A FULL RESTORATION OF WILLIAM FRUET'S LONG OUT OF PRINT CREATURE FEATURE! UPDATE (03/20/2018): Having been unable to reach Bill Olsen via e-mail or social media, I had to take matters into my own hands and get a refund directly from GoFundMe. For the details of what happened with this abruptly cancelled crowdfunding campaign, and learn how you can get your money back, CLICK HERE. UPDATE (03/13/2018): Apparently the crowdfunding campaign was canceled by Bill. I've reached out to him on social media to inquire about the status of the restoration, and to see if refunds are going to be issued to the people that donated! Stay tuned for updates! 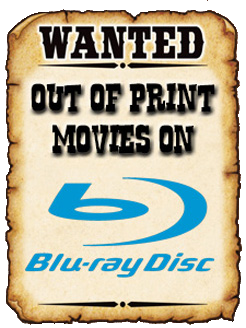 Our bi-weekly WANTED ON BLU-RAY column has been doing quite well Vault Dwellers, and there are plenty of titles on the short list that I can't wait to shine a spotlight on. Imagine my utter surprise when one of those titles, BLUE MONKEY, suddenly popped up in my Facebook news feed just the other day. It seems that Bill Olsen, the owner and operator of Code Red DVD, aims to bring this obscure creature feature to Blu-ray. But unlike his previous efforts in releasing Cult, Horror, and Exploitation classics, this time Bill is looking to crowdfund a high-def restoration of BLUE MONKEY! Just what is this mysterious "azure ape" film I keep mentioning? Synopsis: A handyman working in an eccentric old woman's greenhouse comes into contact with a strange plant and ends up going to a nearby hospital after pricking his finger on the thornless flower. (We later learn it was more likely an insect bite.) Once he arrives in the ICU, he vomits up a rather large larvae, and begins to succumb to an illness that is liquefying his body from the inside out! Soon the disease is spreading throughout the hospital, leading to a government quarantine of the facility. Trapped and desperately seeking a cure, the hospital staff fails to keep tabs on a group of precocious kids from the pediatric ward. The children find the insect that was birthed from the unfortunate handyman, and end up pouring a substance onto it (later found to be a growth hormone) that causes it to grow to gigantic proportions. "HA! Your cans of RAID are now useless puny humans!" 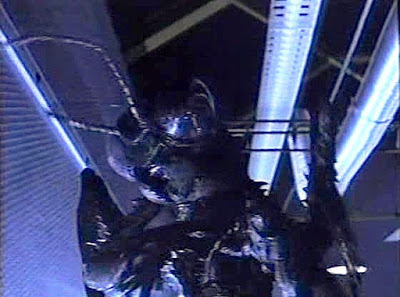 Soon, the giant insect makes itself a nest in the utility tunnels beneath the hospital, and begins laying eggs. It's up to Dr. Rachel Carson (Gwynyth Walsh), Detective Jim Bishop (Steve Railsback), and an entomologist named Elliot Jacobs (Don Lake) to stop the creature, and find an antidote for the growing epidemic! As for the film's misleading title, I've heard two reasons behind it: The first is that the movie was originally going to have a primate-like creature on the loose. The second is that the title (which was originally GREEN MONKEY, but changed because no one wanted people to equate this film with deadly AIDS-carrying monkeys) sort of refers to a creature that one of the kids in the film has nightmares about. Regardless, this movie has absolutely no monkeys in it at all! The lack of colorful apes aside, if this Canuxploitation flick sounds enticing to you at all, then please consider pledging $30 ($25 for the Blu-ray + $5 for shipping) towards Bill Olsen's GoFundMe campaign for BLUE MONKEY's restoration! Let's work together to give this long-requested film a Blu-ray release worth owning Vault Dwellers! And if you're not too keen on donating any money, please share the crowdfunding page on Facebook and Twitter to help spread the word! That was one of the first films I worked on. I would love to hear more about this GBC!